Apple Valley, MN, June 16, 2014 — Uponor North America (Uponor) has been named one of the Top 100 Workplaces in Minnesota by the Minneapolis Star Tribune based on an employee-based survey. Uponor was ranked 20th on the mid-size company list. "It's always an honor to be chosen for an award," says Bill Gray, president, Uponor North America. "Being named as one of the top places to work in Minnesota is especially rewarding because it was based on feedback from the people who know us best — our employees." He adds that the award makes him proud because a high percentage of employees (94%) took the time not only to complete the survey and rate Uponor highly, but also to provide constructive comments in the areas where the company does well and the areas where it can continue to improve. "All of us at Uponor North America — collectively — have created an environment where people respond, not only through exceptional day-to-day performance, but also by participating and giving feedback," Gray says. "We are striving to create something special here at Uponor; our employees' feedback is vital in helping us to continue this journey." Top Workplaces recognizes the most progressive companies in Minnesota, based on employee opinions measuring engagement, organizational health and satisfaction. The analysis included responses from more than 58,600 employees at Minnesota public, private and nonprofit organizations. "The survey results mirror the positive results of great leadership throughout Uponor North America — leadership that motivates teams to their highest performance," says Uponor President and CEO Jyri Luomakoski. "Our customer feedback and success in the marketplace are direct results of these behaviors. We are fortunate to be able to attract and retain great people to fulfill our customer promises." Star Tribune Publisher Michael J. Klingensmith says, "The companies in the Star Tribune Top 100 Workplaces deserve high praise for creating the very best work environments in the state of Minnesota. My congratulations to each of these exceptional companies." The Top Workplaces special section was published in the Star Tribune on Sunday, June 15. 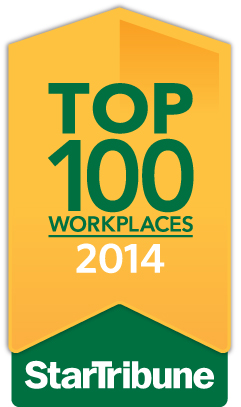 The report can also be found at www.startribune.com/topworkplaces2014. The rankings in the Star Tribune Top 100 Workplaces are based on survey information collected by WorkplaceDynamics, an independent company specializing in employee engagement and retention. To qualify for the Star Tribune Top Workplaces, a company must have more than 50 employees in Minnesota. More than 2,000 companies were invited to participate. Rankings were composite scores calculated purely on the basis of employee responses. Uponor, Inc. is an award-winning provider of plumbing, fire safety, radiant heating/cooling and hydronic distribution piping systems for residential and commercial applications. In 2014, the company received the Community Impact Award for Sustainability and the Progress Minnesota award for driving business growth and economic development. In 2013, the company was named Manufacturer of the Year by the Manufacturers Alliance and a Top 100 Workplace by the Minneapolis Star Tribune. Uponor, Inc. employs nearly 500 people at its North American headquarters in Apple Valley, Minn. For more information, visit the Uponor media room at www.uponorpro.com or www.uponor-usa.com or call (800) 321-4739. For more information about Uponor, visit the Uponor media room at http://uponor.greenhousedigitalpr.com/archive/ or www.uponor-usa.com/mediaroom. Thomas Enterprise Solutions is a trademark of Thomas Publishing Company. AutoCAD and Revit are registered trademarks of Autodesk, Inc.
CATIA is a registered trademark of Dassault Systemes, S.A.
Pro/ENGINEER is a registered trademark of PTC Inc.
SolidWorks is a registered trademark of SolidWorks Corporation. Solid Edge is a registered trademark of Siemens Product Lifecycle Management Software Inc.
Uponor North America was ranked 20th on the mid-size company list for 2014. *To download a hi-res image file, click on the file name and a zip archive automatically downloads to your computer. Due to how various browers handle downloads, you may have to expand the zip archive manually.